Uzbekistan is a beautiful country with rich history and amazing sightseeing in cities like Samarkand, Bukhara, and Khiva. Once, it was at the heart of the Silk Road and attracted traders from all over the world. Nowadays, the country is opening up and easing its visa regime and we have good news for most of the Western countries: since July 2018, it has become quick, easy and cheap to get a visa to Uzbekistan! Since February 2019, most of the e-visa eligible countries became visa-free, except for a few countries. You just need to fill out the online application, pay $20 and, within 3 days, you can download your visa upon email notification. 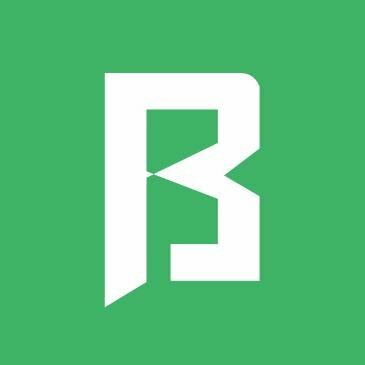 So, now it is the perfect time to visit Uzbekistan as it has not yet become too touristy; however, it is climbing fast to the top of recommended places to visit on websites like Forbes, Huffington Post, and National Geographic, etc. Citizens of Kyrgyzstan do not need a visa to visit Uzbekistan for up to 60 days. Starting from January 2019, citizens of Germany also do not need visa for a stay up to 30 days. Citizens from all other countries need an e-visa or regular visa. Since July 2018, Uzbekistan has successfully integrated its new system of electronic visas. Now tourists can get a single-entry visa for a stay of up to 30 days just for $20 USD. 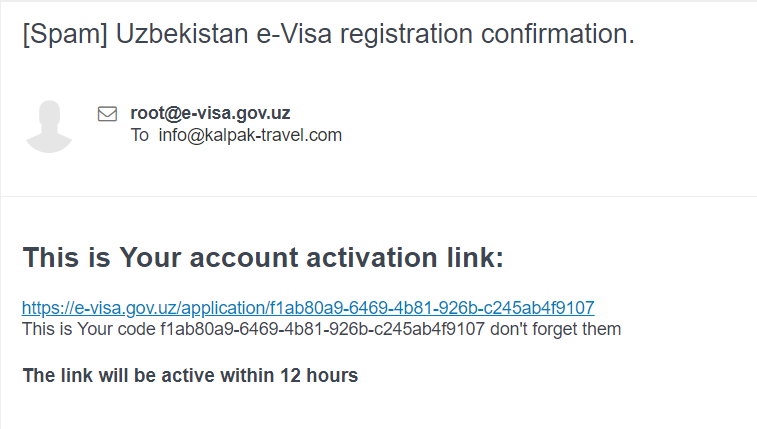 You can apply for an e-visa at least three days before your planned trip and you will receive it through email. 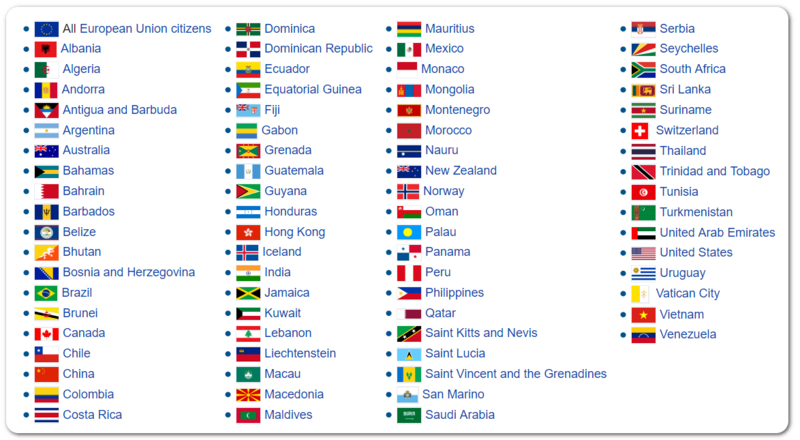 Many Western countries can obtain an e-visa through the official electronic visa portal of Uzbekistan. You must select arrival and departure dates. Please note that a visa is valid for 30 days in a 90 days period. You can upload a copy of your passport (main page with photo and signature)– make sure the file size is not too large, no more than 500 kb, and it should be jpg format (.jpg, NOT .JPG or .jpeg or similar). Upload a photo of yourself. Please make sure your head is big enough on the photo and the background is white. Also, make sure that the size of your photo is not too large. You can use tinypng.com to make the file smaller. To reduce the size of a PDF, you can use, for example, this website: https://smallpdf.com/compress-pdf. If you experience any problems with these files, please let us know. Finally, you need to enter your email address and save. Then you will receive a few minutes later an activation code (you might receive it in your spam folder). If you click on the link, you can continue your application and payment. This can come as spam, so do not forget to check your spam box; you will also need to keep your code because you will be able to download your visa only through this link. Make payment of $20 USD with a Visa card. If your application for visa was successful and was accepted, in ca. 3 working days you will get another email. 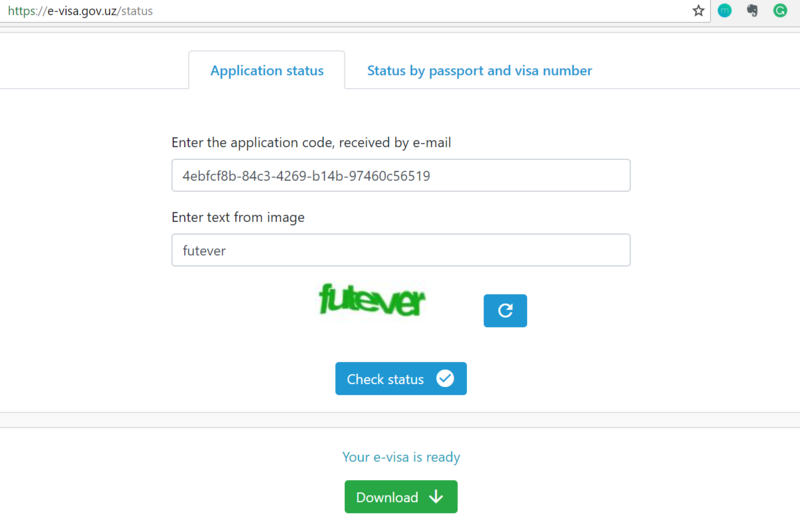 Click on the Uzbekistan Visa Link, enter your code from the first email and you can download your visa. The visa is a single-entry visa, meaning that you can enter and exit Uzbekistan only one time. It is valid for 30 days within 90 days period from the time you applied for the visa. Make sure to print out your electronic visa and keep it with you all the time in Uzbekistan. Even though it is an electronic visa, border guards or police could want to see the hard copy of the visa. Transit passengers from 102 countries are eligible to stay in Uzbekistan for up to 5 days without a visa, if they fly in and out of the country and can show the ticket for the onward flight only with Uzbek Airways. If you are traveling with children under the age of 16, you do not need to apply for visa. 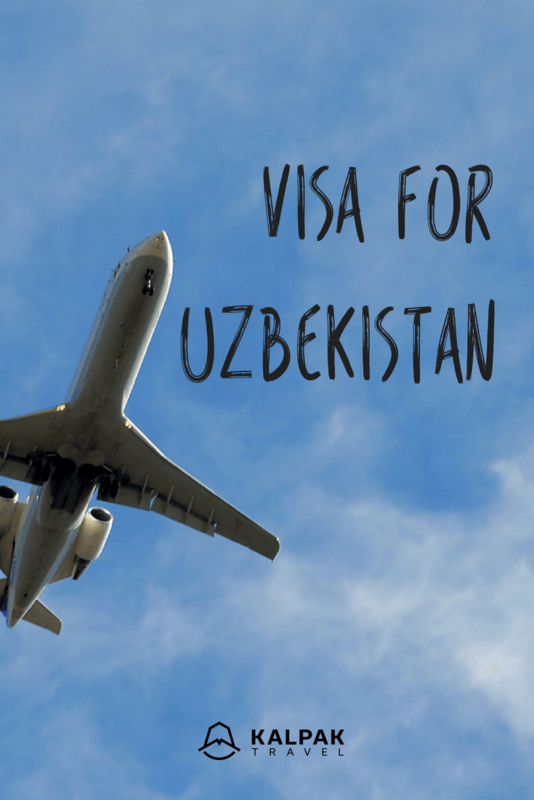 If your child is turning 16 during the trip to Uzbekistan, it is better to get a regular visa, since they will need a visa to exit the country. If you are a citizen of any other country, you need to get a letter of invitation approved by the Uzbek Ministry of Foreign Affairs first. Only then can you apply for the visa at your nearest embassy. Please note: requirements and fees vary, so please check directly with the embassy you intend to use. A travel agency can apply on your behalf for the invitation letter if you supply the required information to them. Please allow three weeks in such cases to get your invitation letter approved. Regardless of where you apply, the application form is always the same. If there is no Diplomatic Mission of Uzbekistan in your country or from the country from which your flight departs, you will be able to get your visa at the airport in Tashkent. To do so, you will require an approved invitation letter. The visa counter at the airport is open 24/7 and you will just need to bring between $60-80 USD in cash together with your invitation letter. The visa will be issued immediately and there will be no need to fill out an application form. Here you can find a list of all Uzbek Diplomatic Missions abroad including contact information. Good luck with your visa application and, if you have any questions, please do not hesitate to contact us. Enjoy your trip to Uzbekistan or, if you have yet to book anything, have a look at our Uzbekistan Tours.